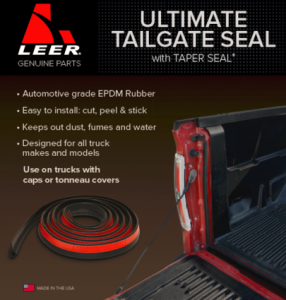 Customize your ride with LEER accessories! For more information on the below products, call us today or visit the LEER website. The LEER Locker is a ceiling-mounted storage system that makes the most of the space you rarely use. It’s like an overhead sliding drawer where you can organize your gear, keeping it hidden and securely locked up. 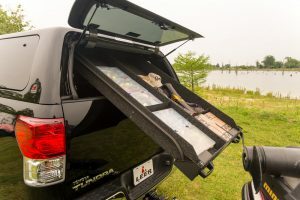 Storage dividers can be adjusted to hold sports equipment, camping, hunting and fishing gear and more. When it’s closed, your belongings are out of sight and out of the way. 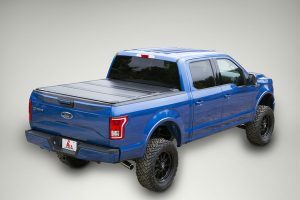 DECKED revolutionizes truck bed storage and organization with an innovative, weatherproof and ergonomic solution for every full size pickup truck owner. 100% American made, the DECKED system features two secure full bed-length drawers that glide effortlessly on industrial-grade wheels beneath a 2,000lb payload-rated deck. 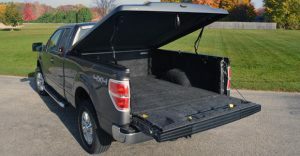 Constructed from rugged High Density Polyethylene (HDPE) and American steel, owners get ergonomic access to tools and equipment while maintaining full use of their pickup truck bed’s footprint. Storage is customizable, and the system, once assembled, is easily installed and removed with no drilling or other alteration of the truck bed. 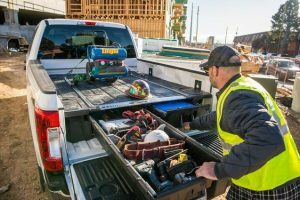 Forget crawling into your bed or trying to reach into your toolbox to retrieve your essentials, DECKED puts all of your critical gear right at your fingertips. Fits all full sized trucks made since the late 90’s with 5’6″-6’6″ beds. The Trilogy X2T by LEER™ is an innovative new tri-fold truck cover, designed with exclusive, patent-pending features that make it unlike any other cover on the road today. Our product designers looked at every component, searching for ways to make the new Trilogy X2T by LEER easier to install and remove, more efficient to use and more secure. Our engineering efforts have also resulted in better water management to protect your cargo. With Trilogy X2T by LEER, you have a dependable, versatile and easy-to-use folding cover that lets you do more at a moment’s notice, no matter how you use your truck. 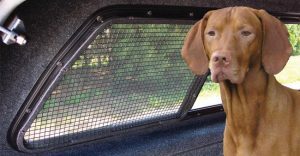 Fabricated of tough vinyl-clad wire mesh, our Screen Protectors are securely bolted to the inside frames of our 50/50 Side Sliding Windows and offer enhanced ventilation and safety for your pets. Your cap can become a spacious, comfortable spot for your pet, whether you’re on the road or parked somewhere along the way. The AeroBlades Roof Rack System is available exclusively as a factory-installed option from LEER, and includes permanently mounted tracks, removable uprights with locks and adjustable tapered cross bars. An upgrade to the standard Thule Tracker II Roof Rack System that offers a truly aerodynamic profile, the AeroBlades system accepts virtually all genuine Thule roof rack accessories with readily available adapters. 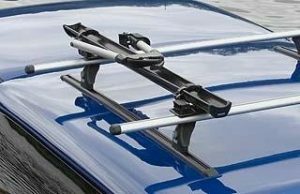 The Thule Tracker II Roof Rack System is the industry’s leading sports and accessory rack, and it’s exclusively available as a factory installation from LEER. With adaptable, functional square tube bars, aerodynamic uprights, security locks and top tracks, the Tracker II is the perfect base system for transporting everything from skis to bikes, and luggage to construction materials. The Tracker II is included as a standard component of LEER Special Edition Packages, and accepts virtually every genuine Thule Roof Rack Accessory. 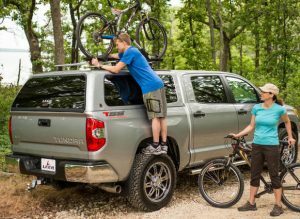 To get the most from your LEER truck cap, ask your LEER dealer to have the LEER factory add a Thule Tracker II Roof Rack System. 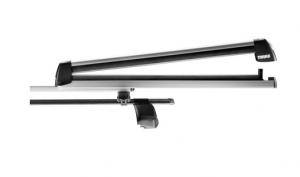 Pull Top Ski and Snowboard Rack by Thule®. The Pull Top is Thule’s top of the line ski and snowboard carrier. The combination of easy, fast installation with Thule’s exclusive Speed-Link™ mounting system and telescoping arms that makes loading skis or snowboards almost effortless is without equal. The Pull Top holds 6 pairs of fat skis or 4 snowboards with ultra-soft rubber arms, it’s completely lockable with the included locks, and can be mounted to Thule rack systems, round bars and most factory racks. The Thule Flat Top securely clamps down to hold snow skis, snowboards, water skis or boogie boards between cushioning rubber extrusions. The Flat Top is included as one of the choices offered with the LEER Adventure Sports Package. Available from your LEER Dealer for any Thule rack-equipped LEER truck cap. The Thule Big Mouth holds virtually any standard bicycle without requiring the removal of the bike’s wheels. A padded clamp holds the down-tube while the wheels are strapped into place in cradles.The Big Mouth is included as one of the LEER Adventure Sports Package choices. Available from your LEER dealer for any Thule rack-equipped LEER truck cap. Thule Side Arm Bike Carrier easy-to-use rack holds a variety of bikes, regardless of design, wheel size or suspension style. 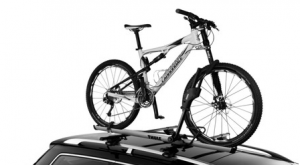 Its quick-load system grabs your bike by the wheels – not the frame – and the bike carrier mounts to most roof-rack systems with universal hardware. The Portage Canoe Carrier with Tie-downs and Quick Draw are right-angle brackets that fit on Thule load bars so that you can transport almost any general cargo. With the included straps, you can secure cargo ranging from two-by-fours to a canoe. 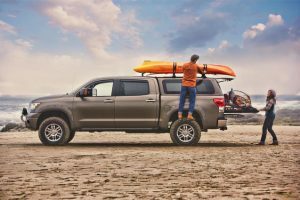 LEER also includes tie-downs and Quick draw required to secure long loads to the front and rear bumper of your truck and the Thule Quick Draw ratchet to tighten the straps. Bundled together, Portage Canoe Carrier with Tie-downs and Quick Draw are one of the included choices with the LEER Adventure Sports Package. Available from your LEER Dealer for any Thule rack-equipped LEER truck cap. The Thule Top Deck Kayak Holder safely cradles and carries a standard whitewater or sea kayak. 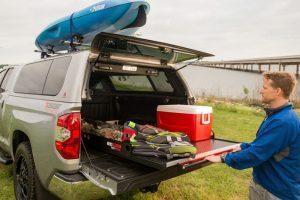 LEER also includes genuine Thule Front and Rear Tiedowns required to secure the ends of the kayak to the front and rear bumpers of your vehicle. The Top Deck is included as one of the choices in the LEER Adventure Sports Package. Available from your LEER Dealer for any Thule rack-equipped LEER truck cap. 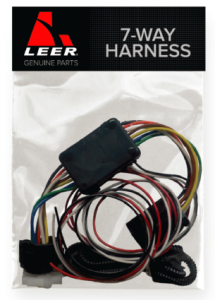 Save time and hassle with the 7-Way Interface Harness. Installation takes as little as 7 minutes and gives you the ability to maintain your 7-way connector functionality and OE vehicle wiring. The 7-Way connects quickly and easily, with no need for cutting or splicing of wires.